Steam is the most common heat carrier in industry. The Industrial Solar Fresnel Collector is optimized for solar steam generation and is thus the cleanest option for process heat supply. The steam generator can be easily integrated to the customer existent steam network and operates automatically and independent from the conventional boiler. Alternatively our solar process heat solutions can be designed to operate using pressurized water or thermal oil as heat carrier. RAM PHARMA, Amman, Jordan, 2017. 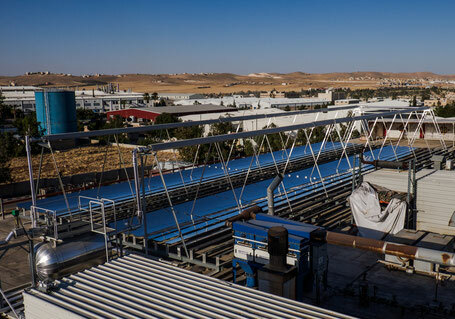 How Does A Solar Steam Generator Work? 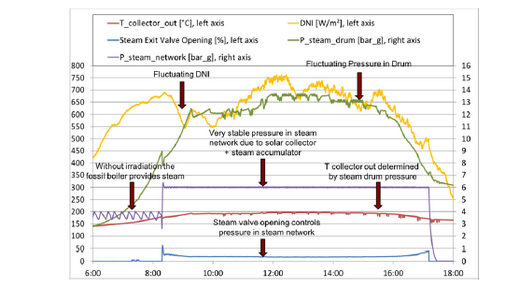 A typical steam generator using the Fresnel Collectors is represented in the diagram. 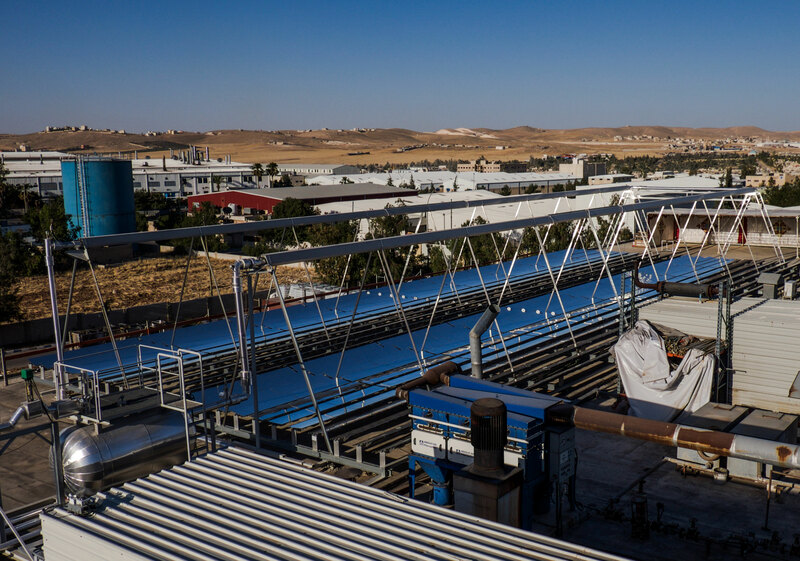 Water is pumped through the collector field and partly evaporates due to the concentrated solar irradiation. In a continuous process, the fluid enters the steam drum where steam accumulates at the top and water at the bottom. This reservoir runs at a higher pressure and temperature providing up to 1 hour of storage, compensating for fluctuations in the demand or eventual shading in the collector field. When steam is released to the factory, feed water is pumped into the steam drum to keep the mass balance. The system is designed with sensors for monitoring the temperature, pressure and irradiation, which permit a safe and automatic operation throughout the day. How is Solar Process Steam Integrated in Factories? Solar steam is smoothly integrated in an existing fuel fired steam supply without the need to alter existing boiler control. The solar generated steam is stored in the steam drum at a pressure above the operating pressure in the boiler. Steam is released to the factory through a pressure controlled valve which has a slightly higher set-point than then boiler. Thus, solar steam is always used first while the fuel fired boiler remains available and automatically starts when solar steam is not sufficient. Measurement Data from June 19th, 2015. A day with several clouds and thus fluctuation in DNI. The sun is an abundant resource, available everywhere. No additional heat exchangers needed. 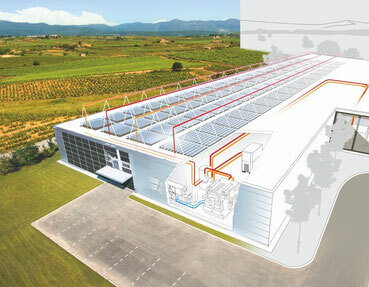 Steam can be directly used in several industrial processes. 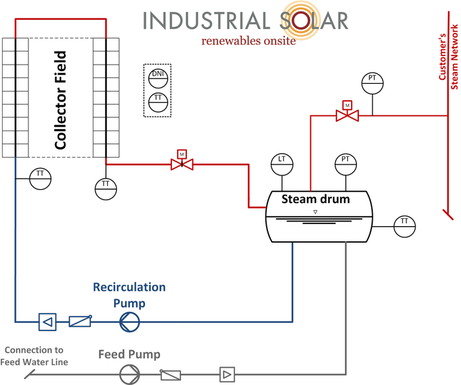 Automatic control of the solar steam generation. Seamless integration to the existent system. Steam / water is harmless for the environment.